Week 6/Midterm Week was a long one! Chilly fall weather abruptly arrived, and I’ve also been sick, but it was another week where it felt like things just came together. As we continued to read informational text to prepare for our novel, I taught some summarizing skills. I know that by annotating the text and asking questions, I will understand the text on a deeper level. I can write a one paragraph objective summary using my annotations and a graphic organizer. We still have a lot of work to do, but with sites like Newsela, it will be a skill we can work on often with current, relevant articles. I know that following the writing process can lead to quality writing. I can use my brainstorming to write a complete paragraph with grade-appropriate vocabulary and language. On Day 1, students had to create a web or list. On Day 2, they completed a graphic organizer that resembled a comic strip. They had a choice to write or draw the events. On Day 3, we had a discussion about Author’s Purpose and they listed the 5 purposes in their journal. On Day 4, we made a T-chart for cause and effect. My goal is to get them in the habit of doing a pre-writing or brainstorming activity every time they write. I see too many disorganized, off-topic responses. I also tried to use a variety of activities to meet the needs of all types of learners. Eventually they will get to choose their own strategy. 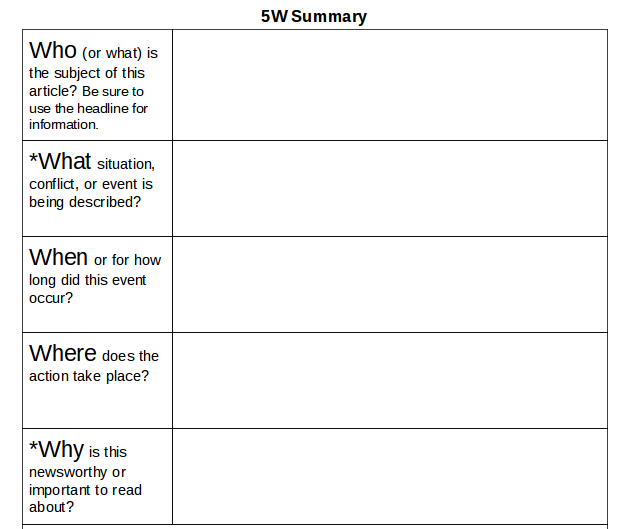 I created a rubric/checklist for grading their Writing Notebooks. I am trying to use this sheet for documentation as well. Every student received a copy and they had some time to self-evaluate before turning everything in. I’ll be excited to share in the coming weeks because we are participating in the Global Read Aloud!! I’m hoping for some great collaboration with other schools. Have a great week!